The Champion Course at PGA National Resort & Spa, a layout redesigned by Jack Nicklaus, is one of the great golf treasures in South Florida. The flagship of the five-course PGA National Resort and Spa, the “Champ,” as locals call it, is home to this week’s Honda Classic, the first stop on the PGA Tour’s Florida Swing and a magnet for an elite field. It is televised Friday on the Golf Channel from 2:00 p.m. to 6:00 p.m. ET, and Saturday and Sunday on the Golf Channel from 1:00 p.m. to 3:00 p.m. ET, and on NBC from 3:00 p.m. to 6:00 p.m. ET. Perhaps that’s what has drawn 16 of the top-25 players in the world to this week’s event, featuring marquee names such as World No. 1 Rory McIlroy—making his U.S. debut in 2015—Sergio Garcia (7), Justin Rose (8), Martin Kaymer (11), Rickie Fowler (12), Hideki Matsuyama (14), Patrick Reed (15), Victor Dubuisson (16), Billy Horschel (17), Phil Mickelson (18) and Brooks Koepka (19). In fact, this week’s field includes 29 of the top 50 in the current FedEx Cup standings; 27 of the top 50 in the Official World Golf Ranking; and four of the top 10 in the Official World Golf Ranking: Rory McIlroy (1), Sergio Garcia (6), Justin Rose (8) and Martin Kaymer (10). It also boasts 2014 major champions Rory McIlroy (Open Championship PGA Championship) and Martin Kaymer (U.S. Open), as well as three rookies inside the top 50 in the FedEx Cup standings (Tony Finau, Justin Thomas and Daniel Berger). But it isn’t just the field that’s significant. The tournament is rooted in the community where Nicklaus lives and works, and its primary beneficiary is the Nicklaus Children’s Health Care Foundation, whose mission is to provide charitable support for activities that advance and enhance the diagnosis, treatment and prevention of childhood diseases and disorders. Since inception, The Honda Classic has contributed more than $25 million to national and local charities. In 2014, The Honda Classic was named the “Most Fan Friendly” event on the PGA Tour at the Tour’s annual Best Of awards. The fans and pros aren’t the only ones who keep coming back for more—American Honda Motor Co. has served as title sponsor of The Honda Classic since 1982, making it the longest-tenured sponsor on the PGA Tour. The Honda Classic has been played on the course since 2007, but the Champ has hosted numerous PGA of America events since 1982, one year after Tom and George Fazio opened its greens for play. It has been the site of the 1983 Ryder Cup, the 1987 PGA Championship and the Senior PGA Championship from 1982-2000. Golf Channel’s “Big Break: The Palm Beaches,” airong now on the network, was filmed at PGA National and the Champion Course. Golfweek has dubbed the Champion as one of the nation’s “Best PGA Tour Courses You Can Play,” one of the “Best Resort Courses” (2013, 2014, 2015), and Best State-by State Courses You Can Play (2014). Golf Magazine named the Champion to its lists of the Best Public Courses By State (2012) and The Best Courses near You (2014). 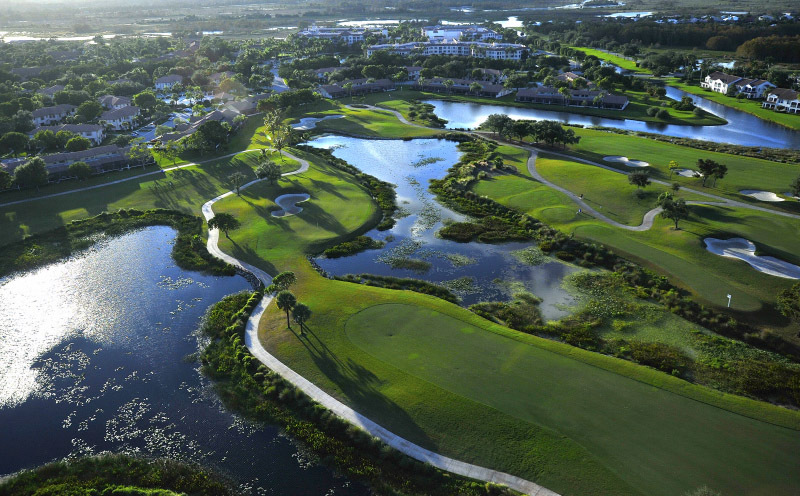 Golf Digest named the course to its 2015 list of the Top Public Courses in Florida. The walls inside the clubhouse are filled with rare pictures and memorabilia of the events and the victors. If you love to play on superb layouts, play where the pros play and share a sense of golf tradition, then the Champion is the course for you. Six sets of tees range from 7,045 to 5,145 yards and allow you to choose just the right distance for your game. I like the blue tees at 6,373. What makes the Champion an incomparable experience is Jack’s 25-year-old redesign of the original layout. He invigorated the 18 holes in 1990 by adding length and bunkers and by resculpting the fairways and the greens. He has continued to tweak and dial in the Champ to parallel the tournament’s continued ascension. Sixteen is a relatively short par 4 at 391 yards from the blues and 434 for the pros. Well bunkered right and left to present a small landing area, the hole demands accuracy off the tee. Most of the tour pros use irons or hybrids. The second shot is played completely over water to a large, undulating and elevated green. Seventeen, at 155 yards from the blues and 205 yards from the Honda tees, is an imposing par 3. From both tees, all you can see is water in front and then a sliver of a green with a cavernous bunker on the left. Even hitting the bail-out area left of the green and short of the trap requires great skill. Include the blustery and unpredictable South Florida winds and the pressure of the moment, and the Bear Trap leaves only the winners somewhat unscathed. The other 15 holes are pretty special, too, and will require every club in your bag and all your talent as well. The course is always in immaculate condition with lush, generous fairways and large, rolling TifEagle greens that Stimp in double digits and roll true. The swirling wind, the ubiquitous water, the well-placed bunkers and the abundant Florida vegetation only add to the golfer’s appreciation of the round. Nicklaus unveiled his latest renovations to the course last October. He focused on the 465-yard par-4 14th hole, which leads into the Bear Trap—and now might be scary enough to become the fourth member inducted into the vaunted collection. Specifically, Nicklaus moved the green 17 yards to the right, which brings the greenside lake much more into play. Bunkers also were added in front of and behind the green, the tee was moved back 10 yards, and an additional 20,000 square feet of spectator mounding was added to improve the sightlines during The Honda Classic. In addition, Nicklaus expanded four greens—on Nos. 1, 9, 15 and 17—back to their original size, and the tees, fairways and areas surrounding the greens were converted to Celebration Bermuda grass. The regrassing means the course won’t have to be overseeded anymore, and should play firmer and faster. Parts courtesy Leigh MacKay, Contributor, worldgolf.com.